I've just hung these orange curtains from IKEA. I've lived a blissful curtain-free existence for about seven years now; my last home had blinds and this flat has had bare windows for eighteen months. 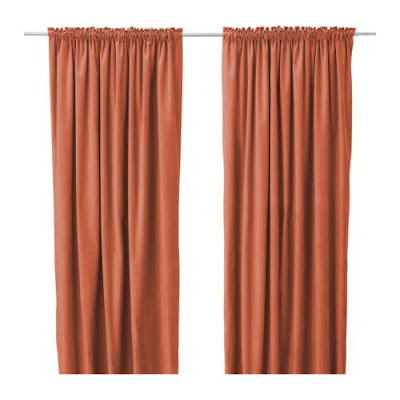 These curtains are a long-term temporary solution (I want roman blinds in the end, but it will probably take about five years to get around to it) and because it is temporary, I thought I would throw caution to the window and buy curtains in orange. It actually goes well with my (not quite finished) grey walls, and brown sofa, but what I wasn't prepared for was the dazzle factor. The curtains are so much more orange than the photo above, and they go right down to the floor, and there are four of them, so there's no reprieve in my line of sight. I think they are going to give me a headache. Sometimes you should stick to what you know, in your dull, neutral-coloured comfort zone. Or at most, concede to a brightly-coloured cushion or small accessory, easily moved out of sight if it gets too much. He he. Orange is hit or miss. Maybe you'll adjust to them and they won't blind you every time you walk into the room? I've been struggling over what color or pattern of curtains to put in my living room as well. I am tired of being so neutral and really want to take a risk. But you are right- curtains take up a lot of visual space in a room. I hope the orange grows on you over time! I think be bold and embrace orange! Its underated as a colour! They look fab by the way!